The Taw Caw Missionary Baptist Church is located on Granby Lane, just off US 301 east of Summerton. 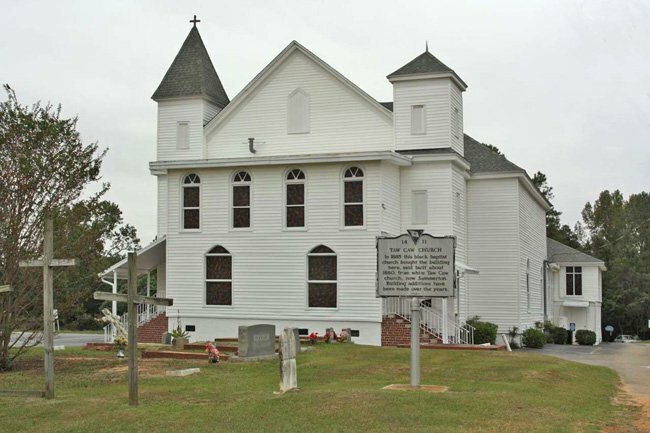 The church serves a large congregation in the Summerton and surrounding areas. After the Civil War, African-Americans were given the opportunity to worship as they pleased, but many in this area had no place to worship. The freed slaves began holding services under what was called a “Bush Arbor” up until the year 1885, when the white Baptist owners of this building offered to sell them this church, which was severely damaged by a fire and in need of repair. The local African-American Baptists bought this building and land on March 23, 1885 for $400. Taw Caw Missionary Baptist Church received its historical roadside marker in 1992. Hello, When I was a child, my Dad always took us to Taw Caw Missionary Baptist Church. Whenever we were in South Carolina, which was two weeks every summer, we attended the family church. Interested to know if you have pictures of all the Pastor’s for your church. So glad to be a member at Taw Caw Missionary Baptist Church since 1995.
i would like to know if Pvt Leroy Thompson is buried there. He was part of thaat Ribbon Creek uncident at Parris Island in 1956. My great grandparents (Fordham Mary and John) childrens Julia, Mary, Susan, Martha and Virgina were members until they moved to Manning. I searching out the history of my family so I thought I should still with Church.